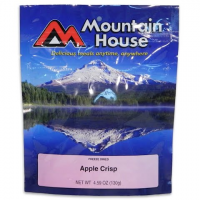 Enjoy potatoes, vegetables and beef in a rich sauce with the Mountain House Beef Stew freeze-dried meal. Mountain House Beef Stew is a camping and backpacking classic. Made with all natural beef, potatoes and carrots, it's hearty and delicious. Mountain House Beef Stroganoff is hands-down one of the most popular meals they make. With real pieces of tender beef and savory mushrooms and onions in a creamy sauce, one bite will make you believe. 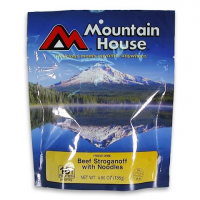 Enjoy tender beef chunks with noodles and mushrooms in a rich sour-cream sauce with the Mountain House Beef Stroganoff with Noodles freeze-dried meal. 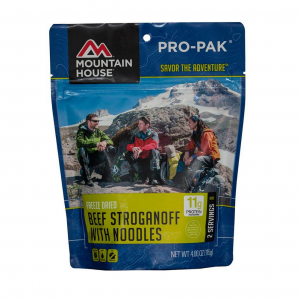 One of the most popular freeze-dried meals ever, the Mountain House Beef Stroganoff Pro-Pak is made with real pieces of tender beef, savory mushrooms and onions in a creamy sauce. Feast on this classic comfort food anywhere your adventure takes you. It's made with real buttermilk biscuit pieces and pork patty crumbles in a perfectly peppered gravy. 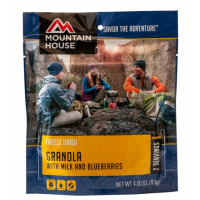 Mountain House's freeze-dried breakfast food provides plenty of options to whet your appetite and keep you fueled no matter where you find yourself. Great for group outings, home emergency kits, or take just what you need on your backpacking trip. 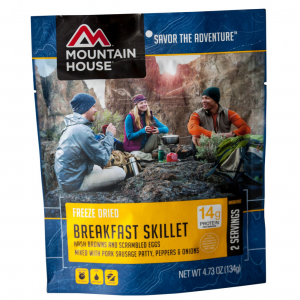 The quick-to-prep Mountain House Breakfast Skillet can be ready to eat in less than 10 minutes. 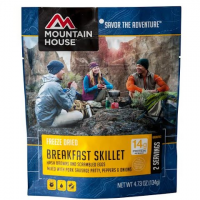 Hash browns, scrambled eggs mixed with pork sausage, peppers and onions for breakfast while backpacking? Yes, please! The Breakfast Skillet is a delicious meal to start your morning off right.